The Auburn Tigers (28-9, #5 Midwest Region) high-powered offensive attack is propelled by transition threes. Let’s look at how they manufacture them. The Auburn Tigers love the three-point shot. The Tigers are sixteenth in the nation in three-point percentage, shooting 38.2% from behind the line. Auburn’s 11.5 three-pointers made per game is tops in the remaining NCAA Tournament field. Many of Auburn’s threes come in transition offense. In advance of Auburn’s Midwest Region Sweet Sixteen showdown with #1 North Carolina (29-6), we took a look at their transition threes and how they manufacture them. A quick inbounds pass – Get it out of the net and inbounded quickly. Player speed and ball speed – Players not involved in the inbound and outlet sprint the floor. The outlet then gives the ball speed by pitching ahead. Auburn point guard Jared Harper is terrific at pitching the ball ahead. But when no advance pass is available, his mission changes. Harper “cracks the shell” – driving the ball inside the three-point line – to collapse the defense. Auburn’s transition width makes players available in the corners for catch-and-shoot transition threes on kickout passes. Often Auburn ends up with two players running along the same sideline in transition. This is the “Two-Side” and when the ball handler does not attack the empty corner (Frame 1 below), he/she should get the ball to the Two-Side as soon as possible by diagonally passing to either the first or second player on the Two-Side (Frame 2 below). At times there is a 2v1 advantage on the Two-Side. The two players may need “one more” passes, either up or down (Frames 3 and 4 above), to exploit the advantage for an open transition three. Like wine and cheese, Auburn’s aggressive defensive style perfectly pairs with their quick strike attack. Turning turnovers and blocked shots into layups or dunks provides momentum plays. Turning turnovers and blocked shots into three-points provides extreme momentum plays. Much the same as the “scorebacks” and other transition moments above, after gaining possession via the sudden change players gain width then depth with speed and the ball is fired ahead to outpace the defensive recovery. The North Carolina Tar Heels are also know for their transition offense and lightning fast counter attacking. This Sweet Sixteen matchup features two teams who have no fear of playing fast. Much of this game could potentially be played in transition. 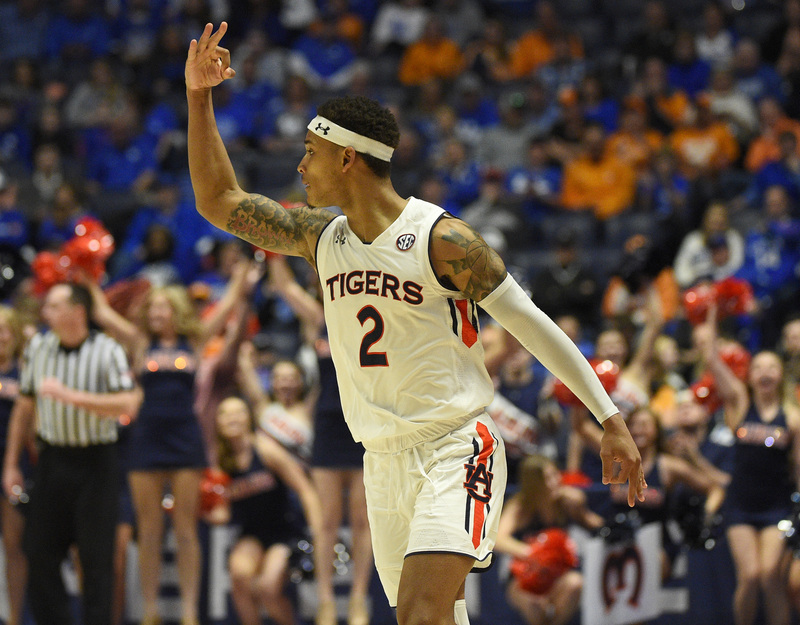 Auburn’s ability to manufacture transition threes could provide the edge needed for a Tiger’s upset. For help with practice planning and implementation of a transition offense attack featuring these principles or other offensive elements for finding, using and creating offensive advantages please contact us and/or join our community for basketball coaches!